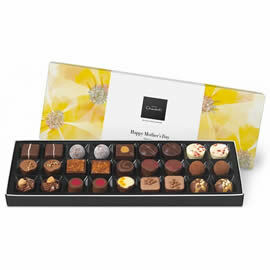 A box of chocolates for Mother’s Day. 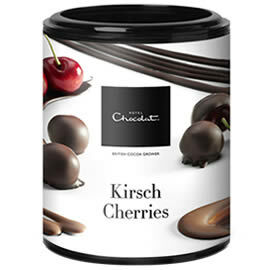 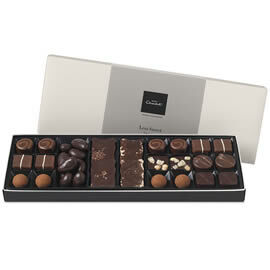 with a selection of milk, white and dark chocolates. 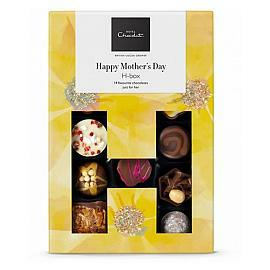 Decorated with yellow flowers and Happy Mother's Day on the front. 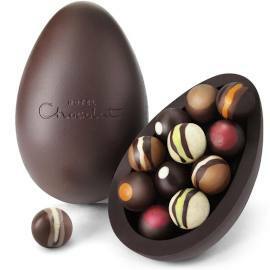 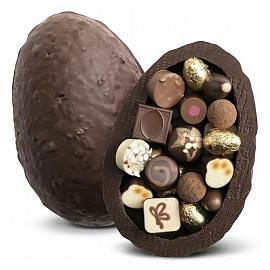 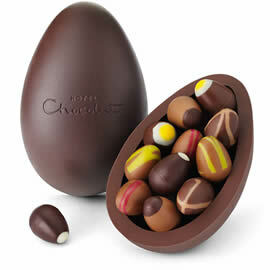 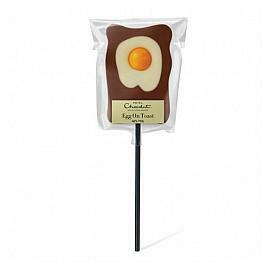 A luxury Easter egg, Hotel Chocolat's The Ostrich Egg, one of the biggest Easter eggs from Hotel Chocolat with 27 chocolates. 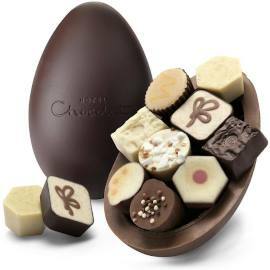 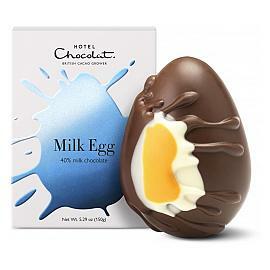 Hotel Chocolat Chocolate Truffles Extra Thick Easter Egg , a luxury half milk and half dark Easter egg with boozy chocolate truffles inside. 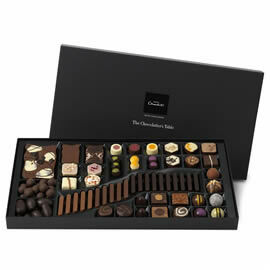 A large box of chocolates just for mum on Mothering Sunday, the Hotel Chocolat Happy Mother's Day Sleekster Chocolate Box. 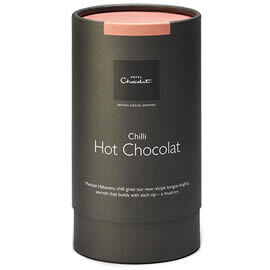 Hotel Chocolat Chilli Hot Chocolat, a smooth, classic drinking chocolate packed with deep cocoa flavour, plus the added warmth of a little Habanero chilli. 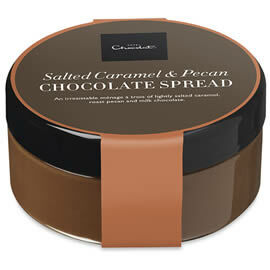 Hotel Chocolat Salted Caramel & Pecan Chocolate Spread, a luxury chocolate spread from Hotel Chocolat, the Salted Caramel & Pecan Chocolate Spread. 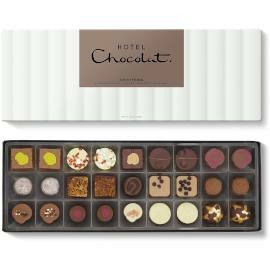 Hotel Chocolat's The All Dark Vegan Chocolate Hamper Collection, a vegan friendly selection of dark chocolates. 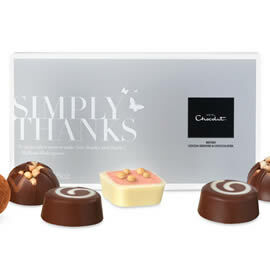 Send someone a Thank You with the Hotel Chocolat "Simply Thanks" Chocolate Box, a small box of chocolates with a message. 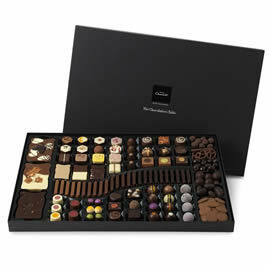 Hotel Chocolat Dark Chocolate Chocolate Box, a box of chocolates filled with a selection of just dark chocolates for dark chocolate lovers from Hotel Chocolat, The Sleekster Dark Selection. 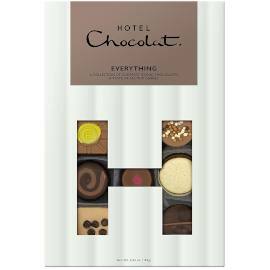 Hotel Chocolat's Everything H-Box, a box of chocolates featuring a selection of the most popular chocolates from the Hotel Chocolat range. 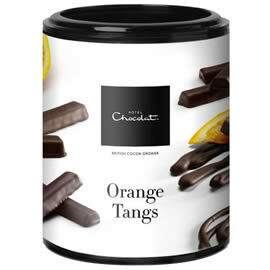 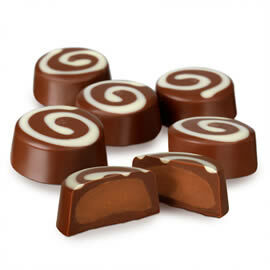 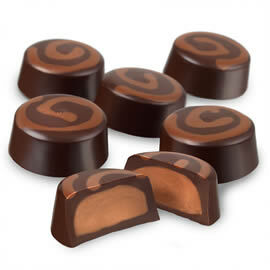 Hotel Chocolat Orange Tangs, pure orange juice enrobed in Hotel Chocolat's dark chocolate, simple but wonderful. 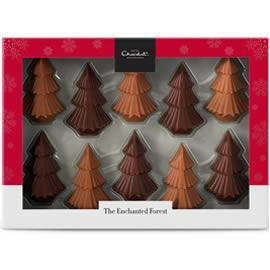 Hotel Chocolat Serious Dark Fix Small Chocolate Box, a dark chocolate adventure, with eight dark chocolates in a ribbon-tied gift box. 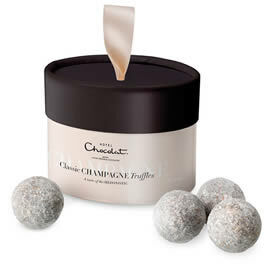 Hotel Chocolat Classic Champagne Chocolate Truffles, melt-in-the-mouth classic champagne truffles in two exciting layers, lightly dusted with icing sugar. 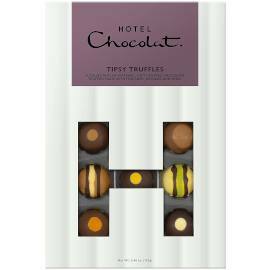 Hotel Chocolat's Tipsy Chocolate Truffles Sleekster, a box of chocolates from Hotel Chocolat with just boozy chocolates, one for the adults. 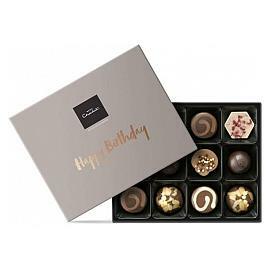 Wish them bon anniversaire and many choccy returns with our specially created box of chocolates emblazoned with 'Happy Birthday'. 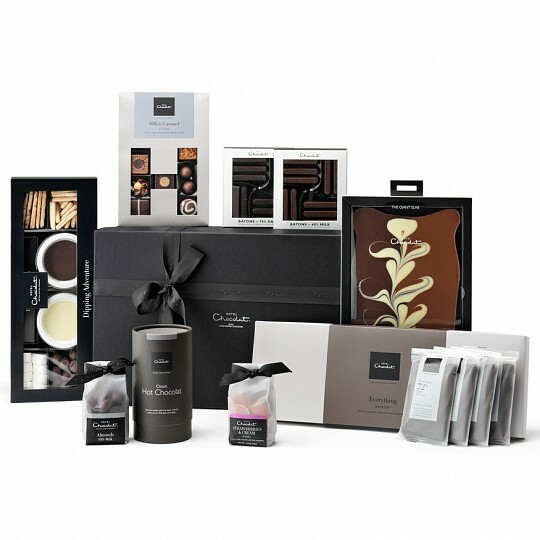 A classic congratulations gift, a hamper of chocolate and a bottle of Italian sparkling white wine; the Hotel Chocolat The Chocolate & Fizz Gift Hamper. 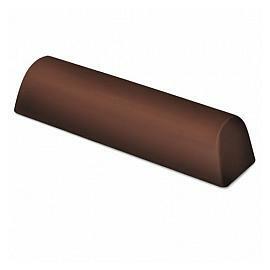 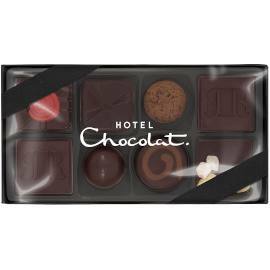 A box of chocolates with alcoholic truffles, a blend of premier spirits and delicious mellow chocolate, the Hotel Chocolat Tipsy Truffles H-Box Chocolate Box. 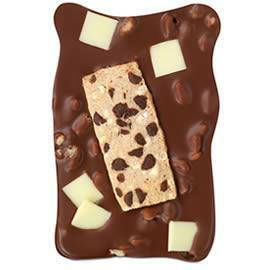 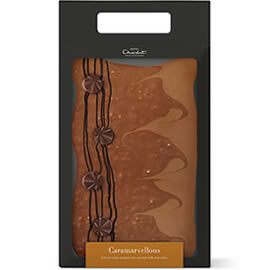 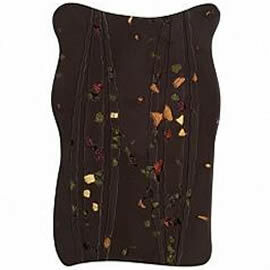 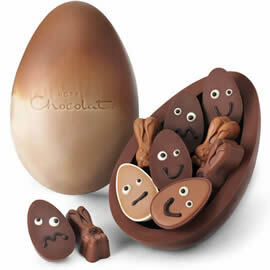 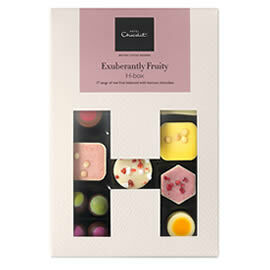 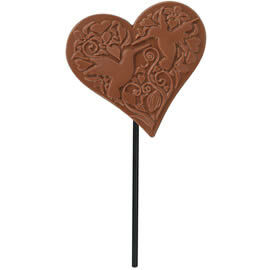 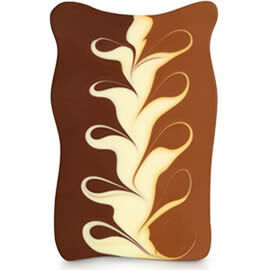 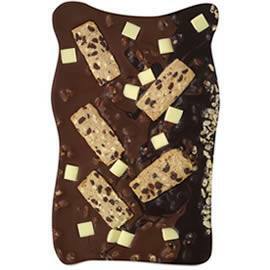 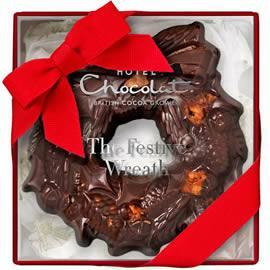 Hotel Chocolat Exuberantly Fruity Sleekster, a chocolate selection box filled with chocolates made with real fruit. 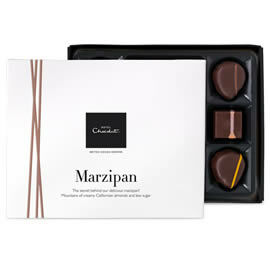 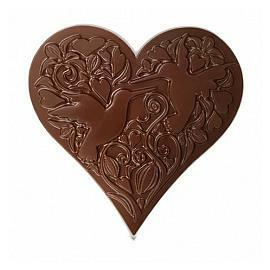 A box of chocolates for marzipan lovers, the Hotel Chocolat Marzipan Chocolate Box contains authentic marzipan in different chocolate recipes. 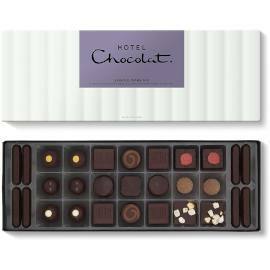 Hotel Chocolat's Less Sweet Sleekster Chocolate Box, the diabetic chocolate box, milk and dark chocolates with more cocoa and less sugar. 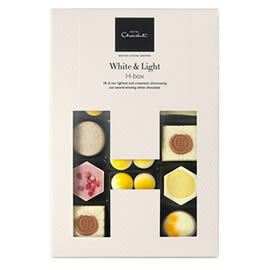 Hotel Chocolat White Chocolate H-Box, Hotel Chocolat's white selection H-Box, a box of chocolates with just white chocolates inside. 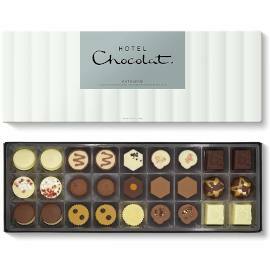 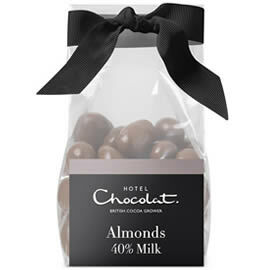 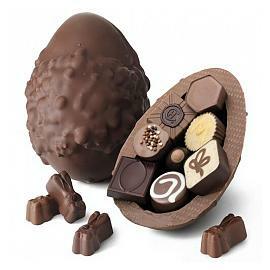 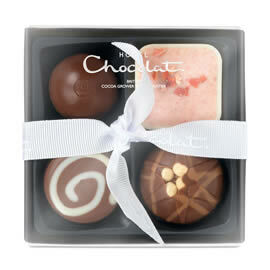 Hotel Chocolat's bestselling chocolate box, a selection of milk, dark and white chocolates. 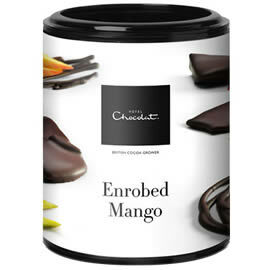 Hotel Chocolat Mango Strips, mango strips in dark chocolate, the tang of mango complements the richer flavours of good dark chocolate. 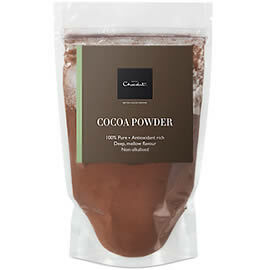 The Hotel Chocolat Cocoa Powder Pouch, premium cocoa powder that any self-respecting kitchen cupboard should not be without. 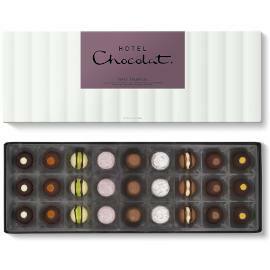 Hotel Chocolat Everything Selection Mini Chocolate Box, a mini chocolate box filled with four of the most popular chocolates from the Hotel Chocolat Everything Selection. 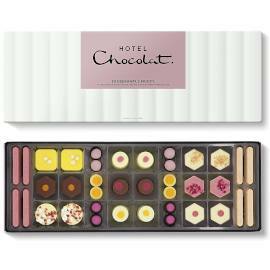 Hotel Chocolat Patisserie Sleekster Chocolate Box, a box of chocolates filled with a selection of chocolates inspired by cakes, desserts and puddings. 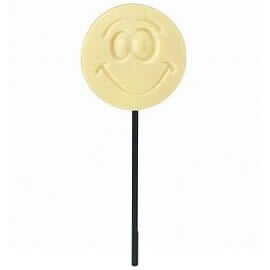 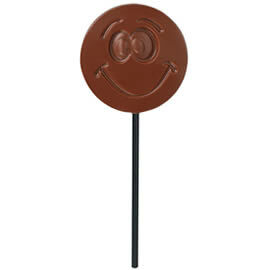 Hotel Chocolat White Chocolate Smiley Lollipop, the White Smiley Lick from Hotel Chocolat is a cute smiley lollipop made from white chocolate. 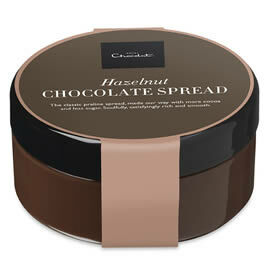 Hotel Chocolat Chocolate Hazelnut Spread, a luxury chocolate spread, classic praline, made with smooth, chocolate and delicious hazelnuts. 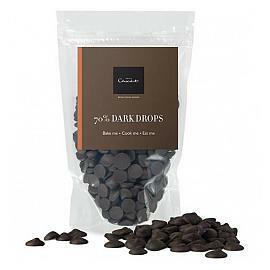 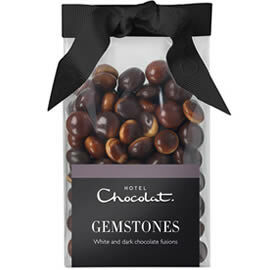 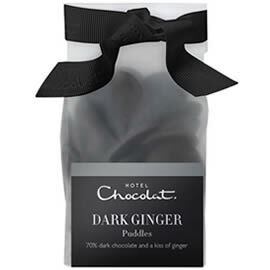 Hotel Chocolat 70% Dark Chocolate Drops, chocolate drops made from 70% dark chocolate making them ideal for cooking or simply nibbling on. 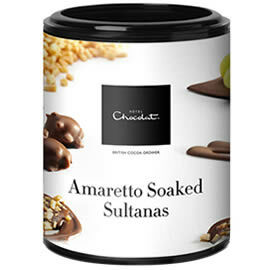 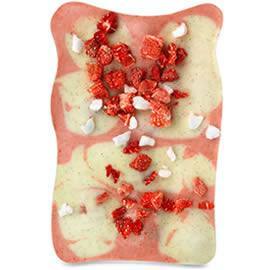 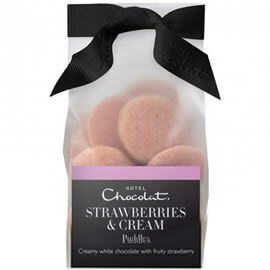 Hotel Chocolat Strawberries & Cream Chocolate Puddles, large white chocolate buttons flavoured with strawberry. 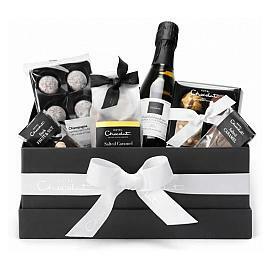 The must-have hamper for colleagues, friends and families to harmoniously share, with something for absolutely everyone. Hotel Chocolat's White Tiddly Pot, a cute tub of baby white chocolate buttons especially for children. 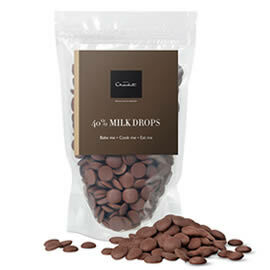 Hotel Chocolat Dark Chocolate Buttons Tiddly Pot, mini chocolate buttons made from 70%, vegan and dairy free, dark chocolate in a tub. 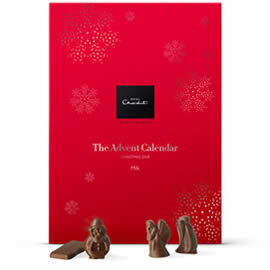 Hotel Chocolat The Chocolatier's Table, a staggering selection of over 65 pieces of chocolate spanning Hotel Chocolat's best-selling chocolate recipes. 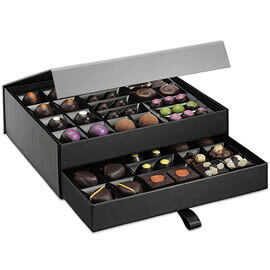 Hotel Chocolat Chocolatier's Table, The large Chocolatier's Table contains over 125 luxury chocolates that truly represent the wondrous selection of chocolates from Hotel Chocolat. 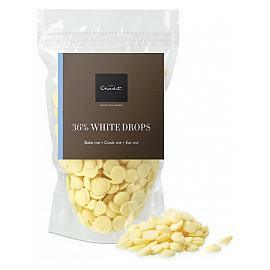 White chocolate drops for cooking from Hotel Chocolat, easy melt white chocolate made with pure cocoa butter. 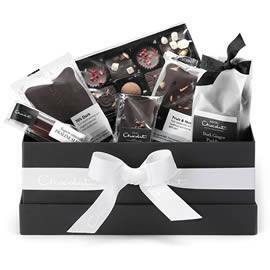 Hotel Chocolat Everything Selection Small Chocolate Box, a box of eight chocolates in a ribbon tied chocolate box from the Hotel Chocolat Everything Selection. 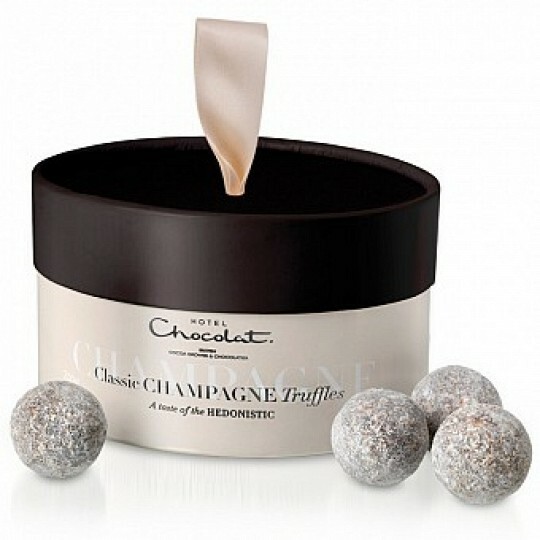 Elegant truffles made with real champagne, cream and just a hint of strawberry for beautifully delicate flavours and a touch of luxurious hedonism. 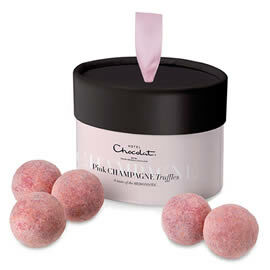 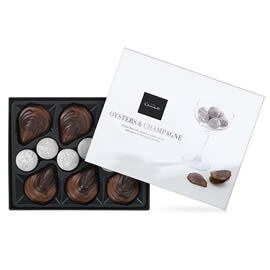 Hotel Chocolat Classic Champagne Chocolate Truffles, a box of eight light and creamy Champagne chocolate truffles. 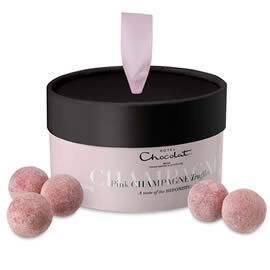 A pink and black miniature hat box filled with Hotel Chocolat Pink Champagne Chocolate Truffles, Champagne flavoured chocolate ganache with a hint of strawberry. 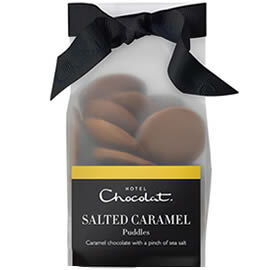 Hotel Chocolat Caramel Chocolate Buttons Tiddly Pot, a pot of caramel flavoured baby chocolate baby buttons. Hotel Chocolat Salted Caramel Hot Chocolat, drinking chocolate, a blend of mellow chocolate and caramel with a pinch of salt. Hotel Chocolat's Classic Hot Chocolat, drinking chocolate made with grated flakes of 70% dark chocolate, for a rich chocolate taste. 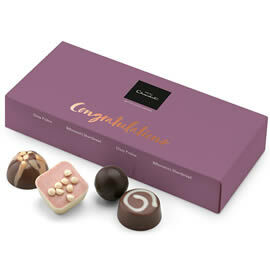 Hotel Chocolat Congratulations Chocolate Box, a small box of chocolates from Hotel Chocolat with Congratulations written on the box. 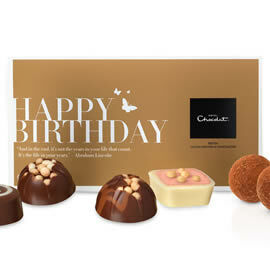 Hotel Chocolat The Happy Birthday Chocolate Box, a selection of 12 chocolates, handpicked to say Happy Birthday in the most blissful way. 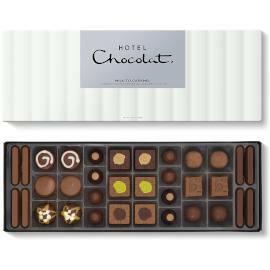 Hotel Chocolat Dark Dizzy Pralines Chocolate Selector, six dark chocolate pralines from Hotel Chocolat with hazelnut praline centres. 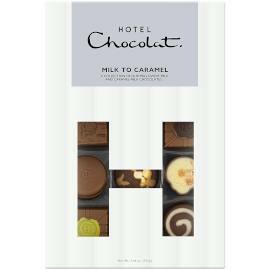 Hotel Chocolat Milk to Caramel Chocolate Selection Chocolate Box Sleekster. 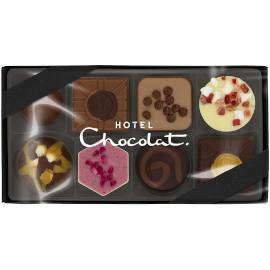 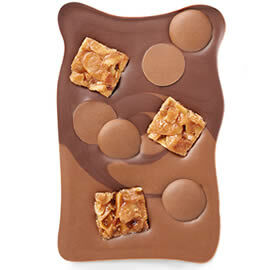 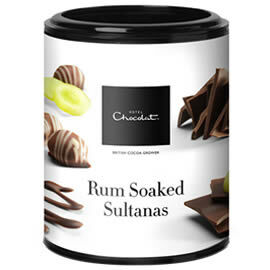 a box of chocolates from Hotel Chocolat with just milk and caramel chocolate recipes inside. 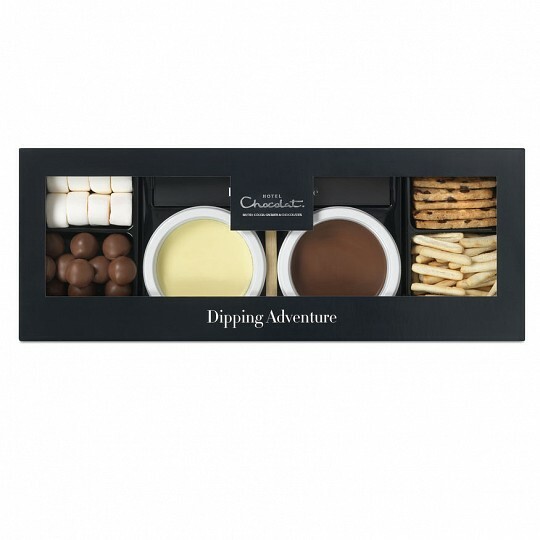 A gorgeous chocolate dipping experience - with milk and white chocolate pots ready to melt and an adventure of nuts and biscuits to dip in. 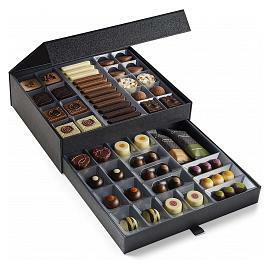 An elegant chocolate box befitting Hotel Chocolat's most delicious dark chocolates, the Hotel Chocolat The Signature Dark Cabinet Luxury Chocolate Box.